Teleflex (USA) hydraulic steering set Baystar for outboard engines up to 150 HP. Includes HC4645H system cylinder, HH4514 hydraulic pump with built-in valves for stoping oil to run back, 2 x 6 m high-pressure hydraulic hoses HO5160 and 2 hose connectors, 2.5 l hydraulic oil HA5430. Hydraulic steering set for outboard engines up to 300 HP. Includes UC128-OBF1 system cylinder (120 ccm), lightweight UP25F hydraulic pump (70 Bar) with built-in valves for stoping oil to run back, 2 x 9 m high-pressure hydraulic hoses and 2 hose connectors, 2 l hydraulic oil. Steering movement is 4,8 rotations for full movement of cylinder. 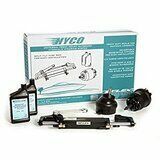 Hydraulic steering set for outboard engines up to 150 HP. Includes UC94-OBF/1 system cylinder (94 ccm), lightweight UP20F hydraulic pump (70 Bar) with built-in valves for stoping oil to run back, 2 x 6 m high-pressure hydraulic hoses and 2 hose connectors, 2 l hydraulic oil. Steering movement is 4,7 rotations for full movement of cylinder. Hydraulic steering set for outboard engines below 115 HP. Includes ”bull horn” UC81-OBF cylinder installed fore (81 ccm), lightweight UP18 hydraulic pump (55 Bar) made of composite plastic with built-in check valves, high-pressure hydraulic hoses (length: 6 m) and the required amount of hydraulic oil. Steering movement is 4,5 rotations for full movement of cylinder. Maximum steering wheel diameeter: 508 mm. Rotary steering System T 67 is suitable for outboard engines up to 55 HP. It can also be used with Morse C230/231, Teleflex, Compact, TX805. Features and Technical information: All stainless steel output end of cable as per ABYC safety standards, Corrosion-resistant materials, Standard friction knob externally adjustable, Four optional helm positions to facilitate steering cable installation, 90 degree black bezel, Lock-to-lock steering wheel turns: approx. 2.5, Stroke: 230 mm, Maximum allowable steering wheel diameter: 380 mm, Minimum steering cable bend radius: 200 mm, Maximum operating load at the tiller end: 1200 N (125 kg). Suitable cable: M58. CABLE AND STEERING WHEEL NOT INCLUDED! Steering system for outboard, inboard and SX-drive engines boat up to 9/10 meters and maximum speed of 50 MPH. Steering cycle is 3, minimum curve radius 200 mm and stroke 228 mm. Suitable cable: M66. CABLE AND STEERING WHEEL NOT INCLUDED! 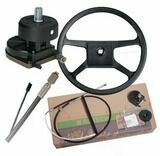 STEERING SYSTEM FULL SET- ULTRAFLEX, ROTECH 4, 8"
Steering system Ultraflex Rotech 4 includes steering box T67 (suitable for up to 55 HP motors), cable M58 with length 8" (243,84 cm) and black Thermoplast V32 steering wheel. Diameter: 340 mm. STEERING SYSTEM FULL SET- ULTRAFLEX, ROTECH 4, 9"
Steering system Ultraflex Rotech 4 includes steering box T67 (suitable for up to 55 HP motors), cable M58 with length 9" (274,32 cm cm) and black Thermoplast V32 steering wheel. Diameter: 340 mm. STEERING SYSTEM FULL SET- ULTRAFLEX, ROTECH 4, 10"
Steering system Ultraflex Rotech 4 includes steering box T67 (suitable for up to 55 HP motors), cable M58 with length 10" (304,80 cm) and black Thermoplast V32 steering wheel. Diameter: 340 mm. STEERING SYSTEM FULL SET- ULTRAFLEX, ROTECH 4, 12"
Steering system Ultraflex Rotech 4 includes steering box T67 (suitable for up to 55 HP motors), cable M58 with length 12" (365,76 cm) and black Thermoplast V32 steering wheel. Diameter: 340 mm. STEERING SYSTEM FULL SET- ULTRAFLEX, ROTECH 4, 13"
Steering system Ultraflex Rotech 4 includes steering box T67 (suitable for up to 55 HP motors), cable M58 with length 13" (396,24 cm) and black Thermoplast V32 steering wheel. Diameter: 340 mm. STEERING SYSTEM FULL SET- ULTRAFLEX, ROTECH 4, 14"
Steering system Ultraflex Rotech 4 includes steering box T67 (suitable for up to 55 HP motors), cable M58 with length 14" (426,72 cm) and black Thermoplast V32 steering wheel. Diameter: 340 mm. STEERING SYSTEM FULL SET- ULTRAFLEX, ROTECH 4, 15"
Steering system Ultraflex Rotech 4 includes steering box T67 (suitable for up to 55 HP motors), cable M58 with length 15" (457,20 cm) and black Thermoplast V32 steering wheel. Diameter: 340 mm. Steering box Steerflex LT with installation kit and steering cable. Length of steering cable: 8 " (243,84 cm). Steering system suitable for small boats with engine max.55 HP. Steering box Steerflex LT with installation kit and steering cable. Length of steering cable: 9 " (274,32 cm). Steering system suitable for small boats with engine max.55 HP. Steering box Steerflex LT with installation kit and steering cable. Length of steering cable: 10 " (304,80 cm). Steering system suitable for small boats with engine max.55 HP. Steering box Steerflex LT with installation kit and steering cable. Length of steering cable: 11 " (335,28 cm). Steering system suitable for small boats with engine max.55 HP. Steering box Steerflex LT with installation kit and steering cable. Length of steering cable: 12 " (365,76 cm). Steering system suitable for small boats with engine max.55 HP. Steering box Steerflex LT with installation kit and steering cable. Length of steering cable: 13 " (396,24 cm). Steering system suitable for small boats with engine max.55 HP. Steering box Steerflex LT with installation kit and steering cable. Length of steering cable: 14 " (426,72 cm). Steering system suitable for small boats with engine max.55 HP. Steering box Steerflex LT with installation kit and steering cable. Length of steering cable: 15 " (457,20 cm). Steering system suitable for small boats with engine max.55 HP. Steering box Steerflex LT with installation kit and steering cable. Length of steering cable: 16 " (487,68 cm). Steering system suitable for small boats with engine max.55 HP. Steering box Steerflex LT with installation kit and steering cable. Length of steering cable: 17 " (518,16 cm). Steering system suitable for small boats with engine max.55 HP. Compact steering box Steerflex ZTS Gen II single helm with installation kit and steering cable. Length of steering cable: 200 cm. 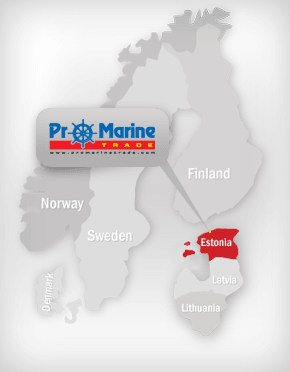 Steering system suitable for up to 7,60 m boats with engine 20-200 HP. Maximum wheel size: 40,64 cm. Minimum steering cable bend radius: 203,2 mm. Approx. 3.8 turning revolution from lock to lock. Standard tapered shaft. Compact steering box Steerflex ZTS Gen II single helm with installation kit and steering cable. Length of steering cable: 225 cm. Steering system suitable for up to 7,60 m boats with engine 20-200 HP. Maximum wheel size: 40,64 cm. Minimum steering cable bend radius: 203,2 mm. Approx. 3.8 turning revolution from lock to lock. Standard tapered shaft. Compact steering box Steerflex ZTS Gen II single helm with installation kit and steering cable. Length of steering cable: 250 cm. Steering system suitable for up to 7,60 m boats with engine 20-200 HP. Maximum wheel size: 40,64 cm. Minimum steering cable bend radius: 203,2 mm. Approx. 3.8 turning revolution from lock to lock. Standard tapered shaft. Compact steering box Steerflex ZTS Gen II single helm with installation kit and steering cable. Length of steering cable: 275 cm. Steering system suitable for up to 7,60 m boats with engine 20-200 HP. Maximum wheel size: 40,64 cm. Minimum steering cable bend radius: 203,2 mm. Approx. 3.8 turning revolution from lock to lock. Standard tapered shaft. Compact steering box Steerflex ZTS Gen II single helm with installation kit and steering cable. Length of steering cable: 300 cm. Steering system suitable for up to 7,60 m boats with engine 20-200 HP. Maximum wheel size: 40,64 cm. Minimum steering cable bend radius: 203,2 mm. Approx. 3.8 turning revolution from lock to lock. Standard tapered shaft.